Wall jump, spin, split fire and take two goons out. Land, spin, reload, kick a fuel can into the air, detonate for a big multikill. 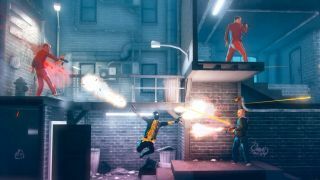 In My Friend Pedro you play a balletic gunman on a mission to dispatch phalanxes of thugs with maximum style. Every slow-motion spinning kill ticks up your score. The point here isn't to merely survive and complete the level, it's to dispatch perps with combos so spectacular you have to capture the footage and share a gif on the internet. There's a button that will package up moments into gifs for you, because My Friend Pedro knows what it is. Your slow-mo bar is generous enough to keep you in bullet time for pretty much as long as you like. That lets you aim your twin pistols at multiple targets using a neat control system. You mouse over your first target and hold the right mouse button to pin a reticle for your off-hand gun, then you aim at your other target and use left-mouse button to fire both weapons at the same time. This is useful for diving into rooms full of flanking gangsters, which you do a lot. Every room in playable demo felt like a toybox full of objects to play with. The kick button lets you knock over tables for cover, kick goons through panes of glass, or even kick bits of goon at other goons. If you kick a goon's head at another goon's head, it will kill that goon, and you will earn points. This is a very fine game. Your character feels as light as a paper cutout as you jump around, reload, and spin to dodge enemy bullets. You're frequently springing off tip-toes and floating over the heads of your tracksuited foes. It feels great, and the controls are so slick I was stringing together awesome combos after just a few rooms. If you kick a saucepan into the air and shoot it, the ricochets are guaranteed to hit nearby enemies. My Friend Pedro is due out in 2019, but there's a chance you've played it in some form already. An early Flash version was released ten years ago. Since then the game's lone developer Victor Agren has pursued a career at Media Molecule working on the LittleBigPlanet series before going indie once again to expand My Friend Pedro into a full game. It looks great too. The backgrounds are inspired by the Tokyo street photography of artist Liam Wong, who uses a strong purple palette. Your gunman's yellow jacket and red explosive canisters helpfully pop out of the detailed urban backgrounds. Agren mentions Bollywood action scenes as another influence, and I can see that in the way the physics of the world bends to ensure the most stylish action happens in any given moment. If you kick a saucepan into the air and shoot it, the ricochets are guaranteed to hit nearby enemies. Once I have completed the demo level Agren boots up another one from later in the game and shows off his skills with a skateboard. You can ride it, of course, and you can kick it into enemies to kill them. Ideally you will land right back on the board afterwards after a spin and a reload to earn more points. There's a spectacular moment when Agren rides the board through a window, jumps off it and swings on a rope back into the building to gun down more surprised goons. I also get to ride a motorbike in a boss fight level. I shoot cars full of yet more goons until they explode and eventually duel a gang boss in a big truck. He lobs bombs out of a hatch that I shoot in slow motion while backflipping on the bike. It's stupidly good fun. If the game keeps up this level of slapstick nonsense carnage for its entire running time it will be delight. The 2019 release window suddenly seems so far away.